Between the Kia Optima and the existing Hyundai Sonata, it could be said that Korean automakers already offer some of the best cars in the midsize market. 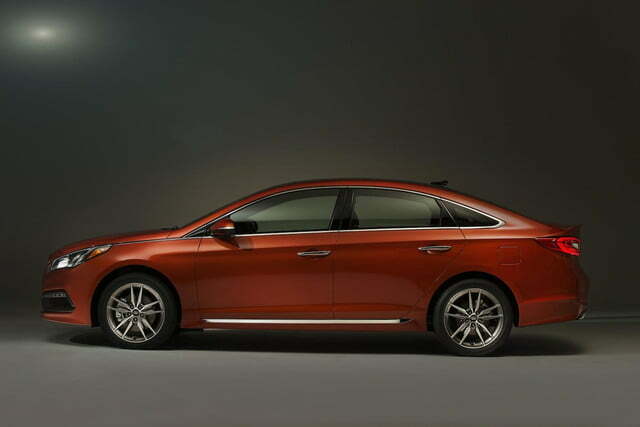 But the release of the new 2015 Sonata in New York today threatens to set a new standard of excellence in the marketplace. Let’s start with the styling. Designers of midsize family cars face a daunting challenge, to create something memorable but not alienating from what is essentially the blandest of shapes. 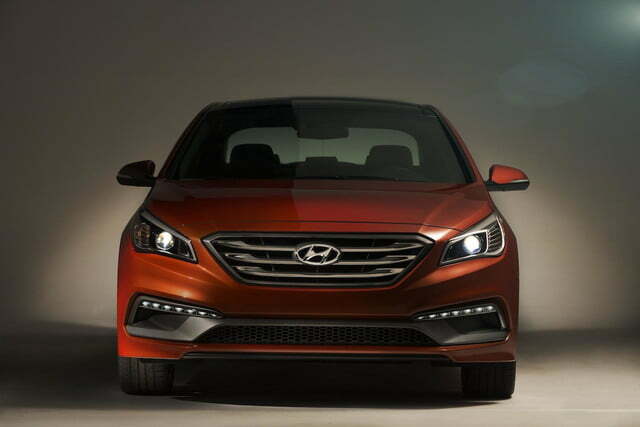 That being said, I think that what Hyundai has achieved with the new Sonata is impressive. Hyundai’s Fluidic Sculpture 2.0 design language is on full display, and the results are a bold car with some truly special touches. I particularly like the new grille, which shares a bit of inspiration with its big brother the new Genesis. Like the Genesis the side and rear profiles aren’t anything to write home about, but the overall effect is still handsome. And Hyundai says that this car is literally the sleekest in the business, with a drag coefficient lower than any non-hybrid in the class. Beneath these sleek lines, the interior is actually remarkably cavernous. 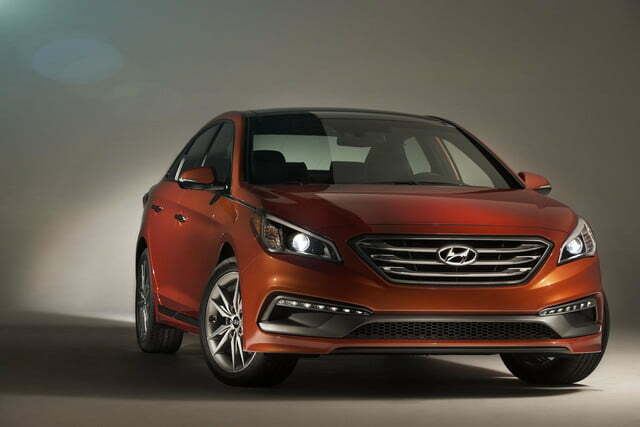 At more than 120 cubic feet of interior room, the new Sonata is not just the most spacious mid-size car in the market, according to your government it actually counts as a “large” car. To haul around all this largeness, Hyundai is using more or less the same powertrains from the existing model. The base engine will be the 2.4-liter Theta GDI four-cylinder. But if you really want to move you have the option of selecting the Sport option with a muscular 2.0-liter turbocharged Theta motor that churns out 245 horsepower and 260 pound feet of torque. This also comes with a few fun styling details like a revised body kit and a D-cut steering wheel. As for handling, the car rides on a new high strength steel platform that promises to be both lighter and stronger than the outgoing model. The new platform is connected to a revised multilink suspension, which will hopefully make this everyday car fun to drive everyday. All of this is well and good, but what Hyundai seems most proud of is the available tech. At the heart of the car lies Hyundai’s new Bluelink 2.0. We had the opportunity to test the upscale version of this system in the new 2015 Genesis, and we liked it there. With 4G LTE, “eyes free” siri integration, and a range of streaming music and cloud computing services, the features are all there. 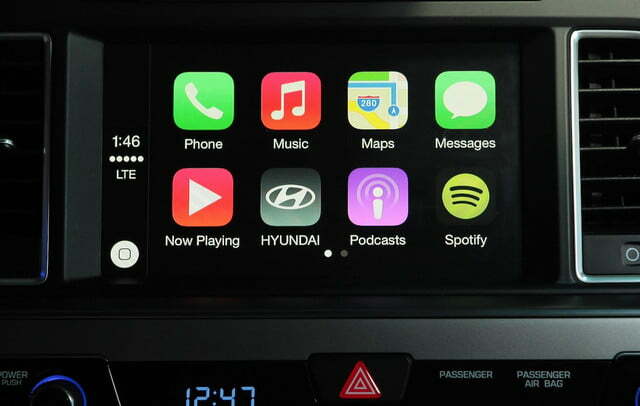 The interface seems fairly intuitive, and I particularly like the new 8 inch touchscreen that Hyundai is rolling out. However, as always with these systems the devil is in the details, and I am waiting a chance to test the system for an extended period before I am convinced. And because this is Hyundai we are talking about, all of these systems should come at a price where the competitors most exciting option is signature floor mats. 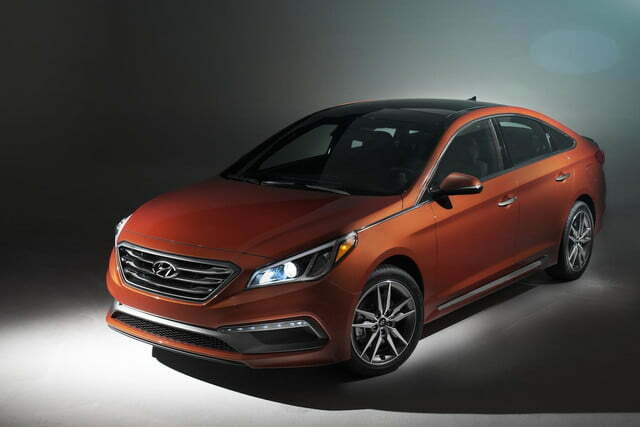 Taken all together the new Sonata promises to be a competitive entry into the midsize field, and if we are really lucky it might even be an exciting option for the practically minded buyer.